Enroute to the collectorate where he reached in a massive procession, Kumar also garlanded and paid tributes to renowned Hindi poet Ramdhari Singh Dinkar. 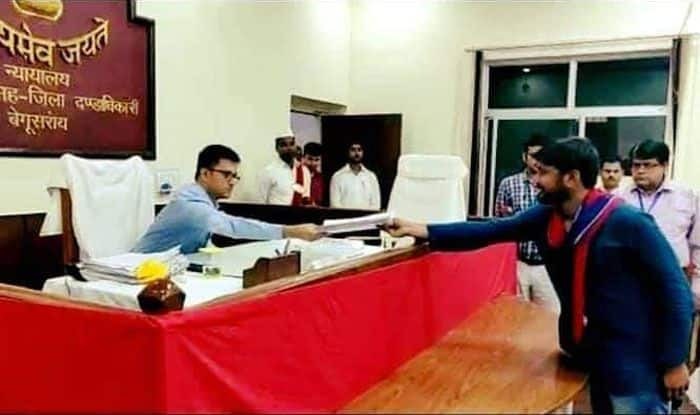 Former JNU students’ union president leader Kanhaiya Kumar on Tuesday filed his nomination papers as the CPI candidate from Begusarai Lok Sabha constituency in Bihar. Bollywood actress Swara Bhaskar, civil rights activist Teesta Setalvad, young Gujarat MLA and Dalit activist Jignesh Mevani, CPI national secretary Atul Anjan and fellow JNU student leader Shehla Rashid making her electoral debut in Jammu and Kashmir – were among those who arrived in this provincial town on the occasion. Kumar is pitted against Union minister and BJP leader Giriraj Singh. Before leaving his house in his native village of Bihat, Kumar shared pictures on social media of himself seeking the blessings of his mother Meena Devi an Anganwadi worker besides Fatima Nafis a resident of Badaun district in Uttar Pradesh whose son Najeeb Ahmed studied at JNU and went missing more than two years ago after allegedly picking up a fight with activists of the pro-RSS ABVP. En route to the collectorate where he reached in a massive procession, Kumar also garlanded and paid tributes to renowned Hindi poet Ramdhari Singh Dinkar, who hailed from Begusarai district, and posted on Facebook a couple of stanzas by the bard which imply until the disparity between man and man is not eradicated, the noise shall not cease, the struggle shall not lose intensity. After filing his nomination papers, Kumar reached the venue of a rally where aforementioned dignitaries were also present amid chants of “leke rahenge azadi” (we shall achieve freedom) the slogan that became famous in the wake of the sedition case that was slapped on him in December 2016. “My fight is against those who conspire to get the people dissipated in bogus polemics so that real issues of bread and butter, health and education and social justice could be pushed to the backburner. Giriraj Singh symbolizes such forces,” Kumar added. Kumar, who was then the JNUSU president, was booked for sedition following complaints that at a gathering organized inside the varsity premises in protest against the capital punishment awarded to Parliament attack accused Afzal Guru, anti-India slogans were allegedly raised. Kumar has been maintaining that he was innocent since although he was present at the spot neither he was the organizer of the gathering nor did he shout any such slogans.